Peter and Francy and their Jersey cows. It was Camembert cheese that brought Peter and Francy Schoeman together, and led them both to the Karoo. Their romance was so agriculturally based it could have been set in a modern-day Thomas Hardy novel. In 2000, Francy was working in a farm near Greyton in the Western Cape, and had big dreams of making Camembert cheese – one of the more difficult cheeses to master. Francy Schoeman has a gift for cheesemaking. “Most of it went to the pigs,” she says ruefully. Peter was working with cows on a neighbouring dairy farm. Lo and behold, the plucky cheesemaker and the tall dairy farmer fell in love. But would they be able to fulfil their dream of raising cows and producing cheese? Francy struggled with the Camembert until she met a cheesemaking mentor Joan Berning of Plettenberg Bay, who supplies cheese cultures. 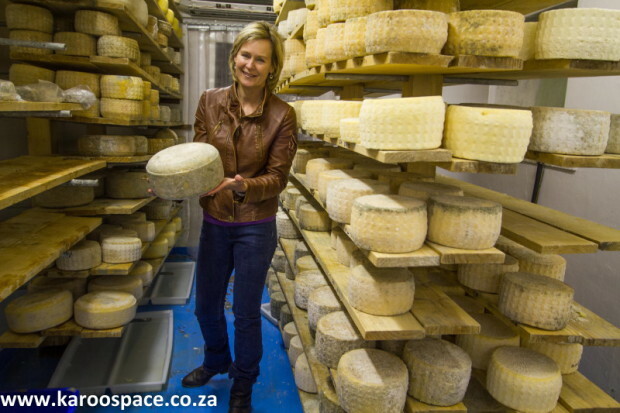 Soon Francy began selling her cheese at the Greyton farmers’s market and did very well. She added feta and cream cheese to her products. One of her signatures is the fine ash rind on the Camembert, fine as talcum. The monks used to do it to preserve cheeses stashed in caves. It lends a unique taste and alters the alkalinity of the rind. But where would they eventually settle? Neither had roots in Greyton. 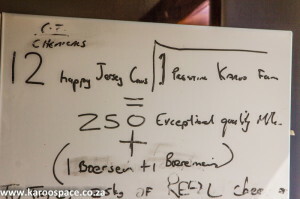 Francy came from Zimbabwe and Pieter came from the Karoo. But no one had lived on the Schoeman family farm south of Williston for two years. Anyway, how would one establish a dairy on a remote farm so deep in the drylands? 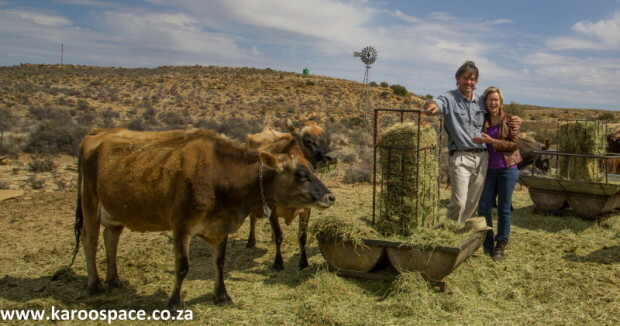 It took some careful planning to make cheese in the dry Karoo. Another cheesemaker, Eddie Bestbier, came out to the farm with them and gave them some ideas about how they could keep it small and make it work. Francy and Peter took a deep breath, made the move and have never looked back. The farm Langbaken lies a long way down a road that leads off the main tar road just before the town of Williston. It runs roughly parallel to the Sak River and every now and then crosses this mysterious watercourse. 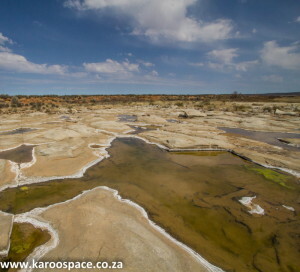 The Sak is the Karoo’s answer to the Okavango, a river delta that never reaches the sea. The Sak River, with its clear water and hig mineral content. It rises in the Nuweveld Mountains near Beaufort West and flows north-west through a stony land. By the time it reaches Williston, the river has usually soaked into the riverbed, leaving only a trace of wet sand behind. But along this road, south of the town, its clear water flows around mineral-ringed rocks. Long before you arrive at Langbaken Farm, you start marvelling at the fact that Francy and Peter Schoeman run a dairy and create fabulous cheese somewhere along this road in such a dry part of the country. It’s the Sak River that makes Langbaken cheese possible, because lucerne grown along its banks is fed to the dozen cows. Langbaken is the only property with a windsock fluttering on the road – there because farmer Peter sometimes needs to land his microlight. The corbelled stone building predates the 1860 house. There is a corbelled building in front of Langbaken’s gracious old 1860 farmhouse, well settled into its foundations, the pepper trees old and tall around it. The corbelled house (depicted on Langbaken’s cheese labels) probably predated the other buildings here. Francy and Peter Schoeman moved here in 2010 with their daughter Alanna. You’d think English-speaking cheesemakers in the midst of Afrikaans-speaking sheep farmers would have had difficulty fitting in. “But I’m lucky that Peter’s family has been here for generations (Alanna is the fifth). And that we have great neighbours. I feel like I’ve come home. I feel as though I’ve returned to a place with the same values I grew up with in Zim, where people help one another,” says Francy. The formula for Langbaken’s success. Outside in an old stone kraal are the happy cows in question, with names like Mariaan, Maggie, Kloks, Vlooi, Dassie, Nana, Karlien and Libby. 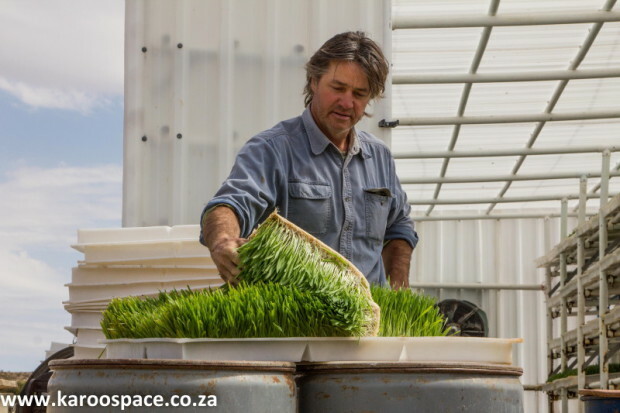 They thrive on the hay and organic lucerne grown along the river, and they are also kept in condition by regular delicious doses of a highly nutritious sprout mix called Bio-Boost. The bovine equivalent of barleygreen. The cows adore the nutritious Bio-Boost. The farm is part of the terroir of this very special cheese, as central to it as Peter’s cows, and Francy’s skills. The beautifully constructed stone walls have stood so long because they were placed with local rain, wind and livestock needs in mind. The doe-eyed Jersey cows each have their own designated milking stall and go to stand there quite happily when being milked twice a day. Maximum hygiene is maintained at all times because Francy follows Slow Food principles and uses raw milk. The pigs eat whey and any mistakes. In one roomy kraal, there are some pigs lurking in the muddy shade and living rather charmed lives. They eat the excess whey from the cheesemaking as well as any failed cheeses too. On the occasions that a pig is slaughtered, Francy gets to try out her charcuterie skills, turning legs of pork into farmstyle ham. She also brought back a recipe for salami from Italy last year. That’s next on the pork agenda. After a quick tour of the immaculately clean coolroom Francy makes us some lunch. We sit in the living area of the farmhouse, wolfing down cheese sandwiches. A ploughman’s feast of handmade cheese and homemade bread. Francy is a modest person, but she really is a great cheesemaker. She was just about to leave for Italy to attend the famous cheese festival in Bra, held every two years and organised by the Slow Food Foundation for Biodiversity. Francy in the coolroom, where the cheeses slowly mature. Hundreds of cheesemakers from all over the world attend the four-day festival, simply called Cheese. 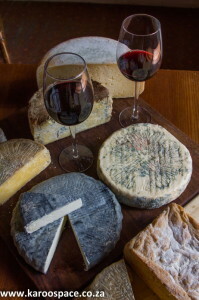 Francy had been invited to showcase her cheeses at a special tasting. 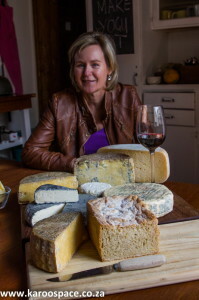 Langbaken, along with four other raw milk cheese producers are part of the new Slow Food Presidium that has recently been launched in South Africa. Langbaken’s range of handmade cheeses. The Schoeman’s pride and joy is the Karoo Blue which has won the Slow Food Award in 2012 and 2013. Intense, creamy, spicy and crumbly, it has all the best of a blue cheese with none of that sharp soapiness. Francy makes a lovely light, piquant firm cheese a bit like an Emmanthaler, but with smaller and more numerous holes, called Karoo Swiss. There is also Karoo Crumble, which is like a mature cheddar, with a tangy bite (it recently took first place in the Raw Milk Category of the SA Dairy Championships, and won one of just 12 Qualite Awards). Karoobossie is a little milder, and Alanna (named for their daughter) is a firm creamy semi-soft cheese with a natural rind. The Camembert comes either ash-coated or with natural rind. Langbaken cheeses are mostly sold in Cape Town, at various delis and food markets. 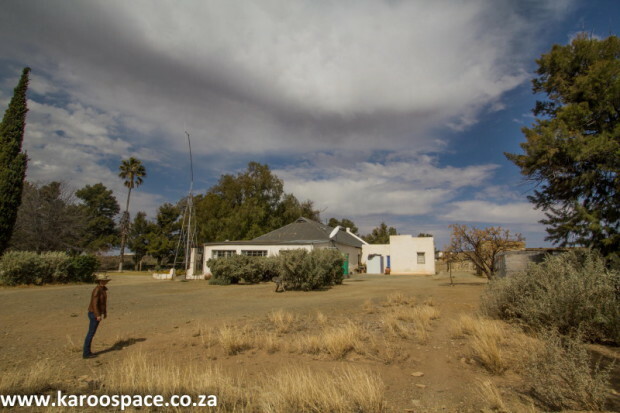 In the Karoo you’ll find them at the Williston Mall and Calvinia’s Blou Nartjie. Contact Langbaken cheese via email langbaken@williston.za.net or their Facebook page. You could also call 053 391 4161 or 082 550 4981. 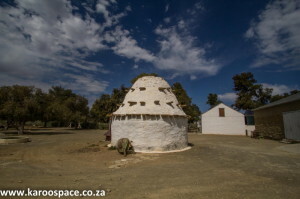 If you want to know more about living in the Karoo try our Karoo Life Series of Ebooks HERE. What fantastic story you two have to tell. Would dearly love to savour your cheeses. We had a tourism function at our farm last Friday night. Martyn Turk came and did a tasting with your cheeses. They were absolutely delicious. If Andrew and I come that way we would love to come and stay overnight and hear more.